How much does it cost to travel to Delphi? How much money will you need in Delphi? €82 ($92) is the average daily price for traveling in Delphi. The average price of food for one day is €29 ($33). The average price of a hotel for a couple is €94 ($105). Additional pricing is in the table below. These average travel prices have been collected from other travelers to help you plan your own travel budget. Proclaimed to be the center of the world by the ancient Greeks, Delphi and its ruins exist on the sloping mountainside of Mount Parnassus. With breathtaking views just over the cliffs, one cannot help but marvel at the sweeping valley dotted with olive trees all the way down to the sea. The beauty of it all truly brings one to a place where they understand why Delphi was marked as the center of the earth. While the archaeological site and modern town of Delphi exist side by side, the real attraction is the historical and mythological allure of the ruins. Home to the legendary Oracle of Delphi and sanctuary to the god Apollo, the worn stone and marble of the site was once a hub of civilization and cultural activity. People would come from all over the ancient world to walk the paths up the steep mountainside to the center of everything. 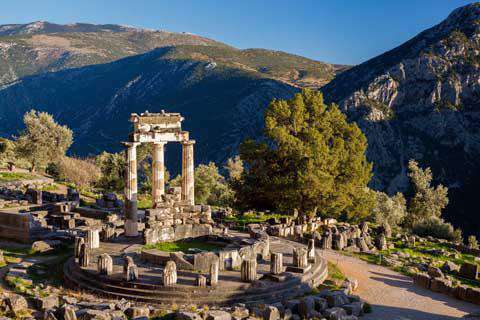 Of course, the archaeological site of Delphi is a treasure that cannot be missedfrom the remnants of Apollo's sanctuary to the Rock of the Sibyl, where it was believed the great prophetess proclaimed her visions. The climb up the mountain with its marble switchbacks is a bit of a hike, but the journey to the center of the world is worth the pilgrimage. Walking the path of the ancients, seeing what they saw, is like taking a stroll into the past. You can almost feel the ruins come to life around you once morethe treasury of the Athenians, Apollo's theatre, and the stadium at the very top where the Pythian and Panhellenic games were once held. There is even a stone navel, called the ompholos, built to symbolize Delphi as the center. Also be sure not to miss the sanctuary of Athena, located just southeast of the Delphic ruins on the other side of the road. The famous tholos with its circular structure is another marvel worth the hike. The modern town of Delphi is located just west of the archaeological site. The streets are very narrow and often one-way, with many hotels and guesthouses as well as taverns and bars to accommodate tourists. The town was once located right on top of the archaeological site, until 1893 when archaeologists discovered that the actual site of ancient Delphi lay beneath. The village was then moved to the west where it has developed and stands today. A few gift shops are located at the edge of town closer to the archaeological site for the convenience of bus visitors. In addition to the exploration of Delphi's archaeological ruins, the Delphi Archaeological Museum is also a must-see. Located within are artifacts unearthed during excavations at the adjacent archaeological site and its vicinity. The permanent exhibition covers over a thousand years, from the Mycenaean era to the Greco-Roman times, and the breadth and quality of its artifacts makes it one of top museums in Greece. From architectural remnants and bronze sculptures to painted ceramics and marble statues, the museum at Delphi is a treasure trove of the ancient past. Unrelated to the archaeology of the area, many visitors come to Delphi in the winter months for the skiing that Mount Parnassus has to offer. Winter or summer, archaeology or skiing, the views of this mountainous haven alone are worth the trip. As with anywhere in Greece, Delphi houses some of the best traditional tavernas featuring classic Greek cuisine. Fresh vegetables from the surrounding areas, as well as expertly seasoned meat dishes can be found in the TripAdvisor recommended Taverna Vakhos, Taverna to Patrikomas, and Telescope Café. Many offer spectacular views of the valley while you enjoy your meal; however, there are also the quicker gyro options if you are looking to spend most of the day sight-seeing. While gyros are considered to be fast food in Greece, the fresh cooked meat with veggies and tzatziki on pita is a thousand times more satisfying than your regular big mac. There are also a few bakeries and gyro joints located closer to the archaeological sites, convenient for tourists to grab a quick coffee and spinach pie, ice cream, or cold drink. Most tourists tend to visit Delphi by K.T.E.L. bus from Athens, which takes about three hours depending on traffic conditions. The trip is doable in one day, but it will be a busy one! Tickets for buses in Delphi are available in some of shops near the bus pick up/drop off site, though you can also buy your ticket from an attendant once you have boarded the bus. Do make sure to have cash on you if you choose this method.